Marine Maintenance has been established since 1997 and servicing the Northwest Florida Panhandle from Apalachicola to Fort. Walton Beach area providing our customers with quality mobile service. Our new Pensacola location opened in 2006 and will be servicing from Orange Beach, AL to Fort Walton Beach, FL with the same exceptional service. 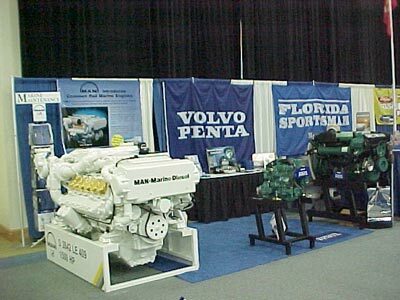 Marine Maintenance is an authorized factory warranty dealer with certified technicians for Volvo, MAN, Kohler, Cummins Onan, Cummins MerCruiser Diesel, Northern Lights, Westerbeke, Mase, Floscan, Glendinning and Algae-X. Do you need help? Parts? Service? Contact us at Parts Department or Service Department. We would be glad to answer any questions you have. I appreciate your response. Enclosed you will find my payment. I look forward to hearing about your developing maintenance plan and will get more actively involved in keeping up with maintenance between your visits. I am with you for all my work. Once again your staff has saved my fishing weekend. It is a pleasure to deal with a company that is professional, knowledgeable, and service orientated. I know being a "Volvo 24-hour Response Team" is killing you, but we Volvo owners love it. Thanks a million from the crew on the "Double Doc"